The earliest drawing reproduced in this book was done in 1889, when he was ten years old; the latest, in 1969, the year he died at the age of ninety. Thus these drawings, spanning eighty years of creative development, enable the reader to trace the evolution of Lindsay’s style throughout his life. The drawings have been carefully selected to demonstrate both Lindsay’s draughtsmanship and the range of his subject matter. There are pages from his voluminous sketchbooks in which he recorded details of subjects from animals to armour; preliminary sketches for what later became major works in oil, watercolour and pen; minutely detailed drawings for etchings; rough sketches showing his notes for colour plans; and pencil portraits which are works of art in their own right. Most of the drawings, however, are from the model, both male and female. His drawings of figures convey the spirit as well as the likeness of the model and have in common with his other pencil works great vitality and spontaneity. 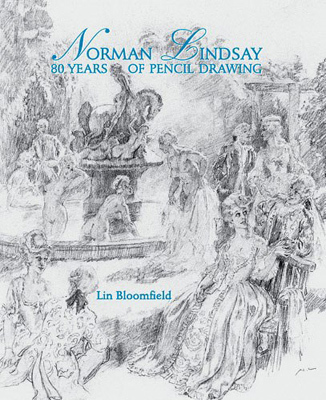 The text complements the drawings, weaving into the book excerpts from Norman Lindsay’s life and providing insights into his relationships with his family, friends and models. There are also many comments from Lindsay’s own writings and from his artistically-gifted family and contemporaries on his techniques, his artistic philosophy and the imagery used in many of his drawings which help to illuminate the work of this extraordinary Australian artist.